We attended our first Imbibe Live last week where we discovered a few new rums we’d literally never come across before. One of those was William Hinton rum from Madeira, a brand that produces two expressions in its range: a white and a 3-year old. “William Hinton created its factory and rum distillery in Madeira in 1845, which produced the best rum from sugarcane fresh juice, carefully selected. His knowledge has gone through several generations until one of the heirs founded the ENM and rebuilt the old original still, to re-produce the best Madeira Rum. 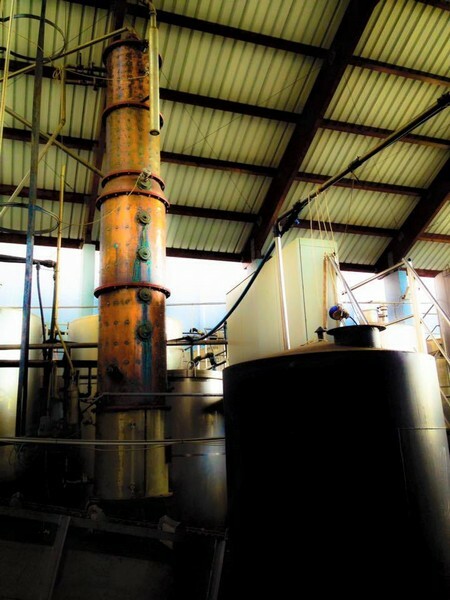 Unlike the traditional French-style rhum agricoles, the William Hinton rum is made using a very old single column still rather than a pot still. However, it’s about 100 years old, which is nothing like the industrial multi-column stills. Both are agricole rums, using sugar cane juice from the island of Madeira. We weren’t aware that either sugar cane or rum were produced on the island, but a little digging (i.e. Googling) informs that it’s a sub-tropical climate ideal for both. Indeed, Madeira has been cited as the original cachaça producer in its age-old aguardente de cana spirit – the sugar cane, pot stills and methods were taken over to Brazil by the Portuguese colonisers. On the nose: On the nose, the white rum has the strong grassy, floral, cane juice aromas associated with agricoles, but we also got a slight almond or marzipan note. In the mouth: Light and mildly citrus and, unusually for a white agricole, the nuttiness in the nose came through ever so slightly in the tasting too. Finish-wise the rum was dry and didn’t linger on the taste buds. As you can see in the photo, the rum is bottled at 40%, which makes it quite smooth, or rather, smoother than the French agricoles commonly bottled around 50%. How is it in a daiquiri/ti punch? As it’s not really a sipping rum, we knocked up a quick daiquiri, our cocktail of choice. It works, but perhaps has the potential to be drowned out by the sugar and lime. We also gave it a go in a ti punch, and we thought that the flavour of the rum came through more. Overall this is a nice mixing rum, I think it would have been even better if it was bottled at a higher ABV. Check out our review of the William Hinton 3 Year Old Agricole rum here. You can find William Hinton rum on Facebook here.